Showtime Australia are the masters of authentic tribute shows of iconic music luminaries, such as Queen, Whitney Houston, Tina Turner and of course the greatest of all, The Beatles, who are featured in Beatlemania On Tour which is currently enjoying a run at the iZulu Theatre at the Sibaya Casino and Entertainment Kingdom. Last seen in Durban in 2010, the show has been tweaked with a brand-new cast and state-of-the-art updates to production and lighting, and revamps to the repertoire and costumes. The marvellous hit tunes are all played in their original key and on replicas of the instruments used by The Beatles creating a sound which is as accurate and faithful to the original as possible. Unfortunately, none of the cast of Cameron Charters (as Paul McCartney), Zac Coombs (as John Lennon), Brent McMullen (as George Harrison) and Ben Harper (as Ringo), bear much physical resemblance to the Beatle they are representing. They do, however, do their best to translate the characteristics, gestures and Liverpudlian accents of the Fab Four. Most importantly, they are all accomplished musicians who perform with skill, gusto and flamboyance, and deliver a pretty good impersonation of the original. Bass player Cameron Charters even went as far as teaching himself to play his instrument left-handed for his role as Paul McCartney. The Beatles, of course, have a massive repertoire and in a show with over two hours of music there is plethora of wonderful and foot-stomping music. I did, however, miss a few of the gentler greats such as Yesterday and Norwegian Wood. 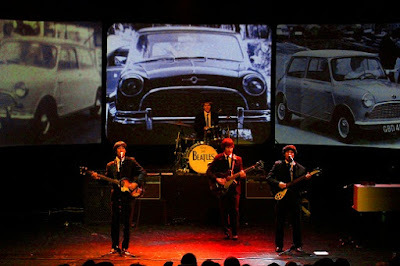 The show is divided into different periods of the Beatles career. Starting with their appearances at the Star Club in Hamburg and The Cavern in Liverpool, through to their growing international popularity and tours to America (including appearances on the Ed Sullivan Show and the famous Shea Stadium Concert in New York), and of course their fabulous psychedelic era. Each segment features music of that era and is enriched by video and slide presentations on a big screen at the back of the stage – and also by the authentic costumes worn by the cast. Two problems. The iZulu Theatre is a huge cavernous space. It is not conducive to an intimate type of presentation and, try as they may, the cast could not get their audience, which was mostly aged, to behave as the screaming fans the Beatles were accustomed to. To compensate for this at one stage, a backtrack of screaming teenage girls was mixed in at a volume that made it difficult to enjoy the music. Secondly, there were a few audio problems in the second half and this may be the reason why the volume of the sound was pushed up to pain level. As an ex-sound engineer, I appreciate and am impressed by high volumes, but this was a step too far. Beatlemania On Tour is an absolute must for all Beatles fans. Since that probably includes everyone maybe you should all go to this well-produced, enjoyable show.